Keeping track of tasks and assigning those tasks can be a challenging and time consuming task that can affect the profitability and efficiency of your business. The Enhanced Microsoft Access Task Management Database is a full-featured task management and calendar system built all in Microsoft Access tables, forms, reports, and VBA (Visual Basic for Applications) code. Based upon some of the concepts of the Microsoft Outlook Calendar modules, this database template has the advantage of being fully 100% Microsoft Access based. This aspect allows for tight integration into your existing Access database. The task database offers a daily, weekly, bi-weekly, and monthly view of scheduled tasks, as well as a form for creating and maintaining tasks. 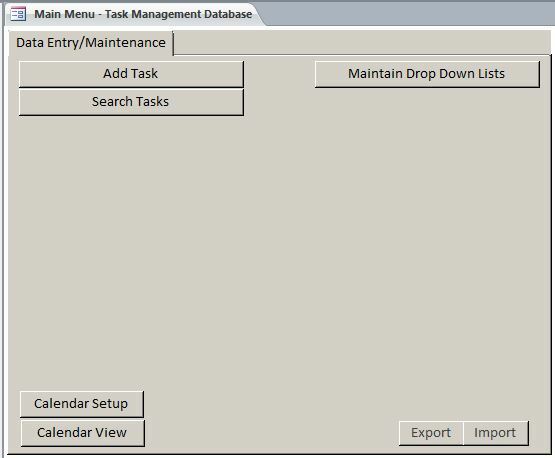 The Task Management Database also includes pre-built daily, weekly, bi-weekly, and monthly reports. Please note that this is a template database. If it does not meet your needs 100%, and you are unable to customize it yourself, let WSI know and we will provide a quote to develop the customizations you need to get you exactly what you want in your Task Management system. $499.99—Unlimited Developer Use—This allows you to use this database template however you wish for any applications you develop and distribute.